"There's the real life for you, embodied in that little cart. The open road, the dusty highway… the villages, towns and cities. Here to-day, up and off to somewhere else tomorrow! Travel, change, interest, excitement!" My pulse still quickens when I read that excerpt, even as it did when I was child reading about Mr. Toad and his madcap adventures in The Wind in the Willows. I love every part of travelling from the casual comments about "wouldn't it be fun to see that…or do that"…. to the next step whereby it is agreed that one SHOULD see or do that..... to the actual moment you mark it on your calendar. 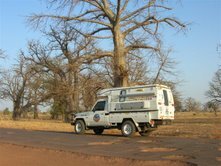 My first Expedition was the Angola Peace and Reconciliation trip in July 2001, and it felt we barely had time to be sure we were fueled before we were rolling along the appallingly terrible Angolan roads greeting the incredibly friendly people…. As part of a large diverse tour group, there were many ups and downs but by month's end, I was hooked to living "on the road". 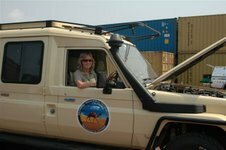 In 2003, the 4 month Cape to Cairo Expedition Return was much the same since we had signed on very late to transport passengers who did not have vehicles. 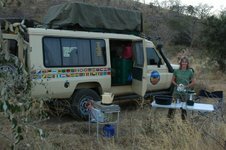 By the end of the Cairo trip, living in one place seemed absurd so we spent a year and a half living in the vehicle mapping Botswana's Game Reserves for the Wildlife Department. 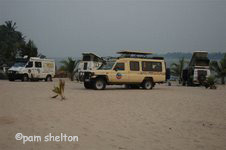 Finally in 2005, I proposed the three month Gabon Expedition, invited our travel friends to join us, and spent almost a year researching and planning our foray: racing through Angola and the Congo's to spend 3 weeks in Gabon's new National Parks before we headed for home. I learned that it's possible to have read every guide book from cover to cover and still manage to get lost. I made the decision to join this Saharan Adventure only this past August so I am scrambling to get ready. I removed the 7 seats from the back of my long wheel base Landcruiser and had a carpeted platform built that rests on the wheel wells with 2 extra supports. No more sleeping on top of ammo boxes as we did in Gabon! 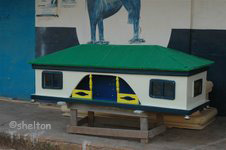 I added two large metal boxes that lock (one is "the kitchen" and the other my wardrobe), stuffed a lantern, side canopy, mossie net and other essentials in the space under the platform and headed to Kalahari Kanvas in Maun, Botswana (where I live) to have a canvas roof cover designed. My vehicle, named THE CAMEL, is a Toyota Landcruiser 2001 which was made into a "stretch" in 2005 by Rajinder Motors in Moshe, Tanzania. The roof lifts up for game viewing and overhangs the front cab and leaves the backend of the interior open to the elements…thus the canvas cover. 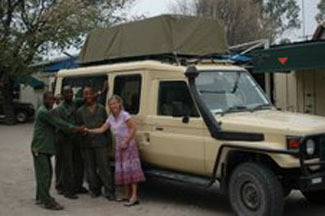 (See the photo above) THE CAMEL is a safari vehicle adapted to fit my purposes….more utilitarian then the King's or the Dier's vehicles which were purchased as mobile homes and are quite luxurious but THE CAMEL suits me and I'm used to driving it. From Maun, I began the trek south with a ten hour drive to Gaborone (Botswana's capital) and had my first night sleeping on my carpeted platform in my bedroll, as I stopped off in Kung at the roadside campground. How lovely to waken at dawn to the sound of yellow weaver birds sitting on the edge of my canopy noisily discussing the merits of my nest. Then on to Gaborone to visit the USA Embassy to get pages added to my passport, obtain a transit visa from the Nigerian High Commission, have a medical check-up, buy four new tires and visit my good friend, Chris Sharp…thanks again for your hospitality, Chris! Then it was off to Johannesburg, South Africa, to stay with Garth and Gail who so kindly had me join their family for almost two weeks so that I could partake of the good things only available in a city. Gail literally took me under her wing, listened to my list of what I hoped to accomplish, and then spent the next two weeks adding my errands to her list. Gail, I can never thank you enough! Arthur Hudson, Gail's brother, saved me from certain catastrophe by checking THE CAMEL from head to tail discovering hidden clots of dried grass along the exhaust pipe (sure set up for a fire), tying up loose wires and dangling cords, and adjusting THE CAMEL'S electricals, and most importantly, sorting out the air conditioner. No longer will I have to duct tape the button in place! The Diers even managed to turn me into a Springbok rugby fan as we watched the last three matches ending with South Africa winning the World Cup. I also learned to drink about 20 cups of tea each day which really helps one unwind when things are hectic. Then it was off to Capetown in a dashing six hour drive to overnight at the Merino Hotel, in the Karoo. This is a Dier's favorite and after tasting the succulent Karoo lamb chops served for dinner with the lovely cabbage/potato mash and peas, I understand why. Up at dawn and on the road again, we arrived in Capetown in time for late afternoon tea. We visited the Capetown Diers for a delicious braii and had a wonderful luncheon at Karl and Erna Rosch's home along with Juno and Moon King. By this point, I was definitely ready to begin our travels in earnest so it was with a great deal of sadness (and a bit of angst) that I kissed THE CAMEL goodbye and climbed aboard an airplane to return to Maun to wait until November 20 th when we hope to meet our vehicles in Douala, Cameroon. Lest you think I am watching soap operas and eating chocolates as I wait, rest assured my life just cranked up ten decibels in stress! My landlady in Maun decided I travelled too much so I have lost the little cottage I had as a home base the past year or so…I am packing my things into two containers installed at Maun Senior Secondary School, selling whatever will not fit and will literally be moving into THE CAMEL fulltime. I have a fairly large "family" network of Batswana that I watch out for, so I am busy providing for them during the months I am gone. I'm also busy organizing daily book tables in front of the local market advertising the importance of reading, encouraging Batswana to read to their children by choosing a book…all a part of Botswana Book Project. Lastly, in my self appointed role as the Expedition Librarian, I've purchased all the travel guidebooks in print relating to our trip and each day for the next two weeks, I will write an "in a nutshell" summary for each country we plan to visit…so we won't miss any of the highlights. That should take my mind off the fact that THE CAMEL is out to sea without me! There is a true “I’m on holiday” attitude that has carried us through all the mishaps of the past few days. I remember reading a poster once that said “When you receive lemons, made lemonade!” and I think that sums up the attitude of our Expedition. My impression of the Catholic Mission was that it’s the perfect place to be if you are a missionary on a shoestring budget and anxious for more chapel time. We broke bread with a number of this type as well as a collection of Nuns and affiliated church people. Actually, I’m sorry we were basically expelled. I was looking forward to having another conversation with the three young Cameroonian dentists who work in the rural areas, and wanted to show me how they can fill a tooth (not mine!) without anesthesia. They are frequent guests at the mission. Also, Erna and Karl said they attended the sunrise service in the chapel (although Erna revealed that she had slept through half of it) and I thought I might give that a whirl on Thursday, so I was a bit disappointed to get our exit papers. In the end though, I think it was time to move to Hotel Arcade since the mission air-con was so old and noisy it made me dream of lawnmowers and diesel engines which doesn’t leave one much actual REM sleep time. The Arcade is lovely by African city standards. We each have on- suite toilet and shower, and the bed, although its chip foam, is not from the 18th century. I’ve managed to hook up my laptop in the room and while everyone is taking the afternoon nap, I type updates and country reports…only 5 more to go, since I typed Guinea, Guinea Bissau and Senegal on the airplane. Traveling with a group of friends is definitely the way to go. It always provides you with someone to laugh at your silliness, help you lift your 50kg bag, and prevent you from getting ripped off by pickpockets. 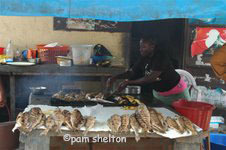 We have been pleasantly surprised by the Cameroonian street traders. They are extremely courteous and not pushy, which of course encourages us to examine all their goods. One dealer spent time teaching me to play the “beans in little compartments game” which he was selling even though I wasn’t buying. Karl bought a fantastic Picasso style mask that “had danced” (was used in ceremonies) and I bought a small pygmy man with multi-colour Cameroonian beads imbedded in the clay that is typical of pygmy art. He is holding his round tummy which symbolizes unity and lack of discord. 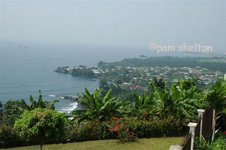 We have organized a bus package to spend the weekend in Limbe which about an hour drive northwest from Douala. 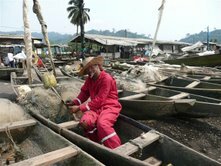 Limbe is a pretty seaside Anglophone resort town noted for its dark brown volcanic sands, botanical garden, Primate Sanctuary, lively traditional market and active nightlife. 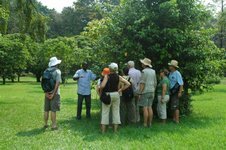 Our bus will stop at the tea Plantations on the drive to Limbe for a quick tour and cuppa. Sunday afternoon we return to Arcade Hotel in Douala to begin round three of negotiations with the shipping agents. Will we ever see our vehicles again? 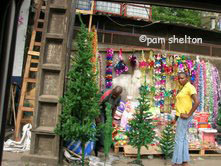 Will we spend Christmas in Douala? Stay tuned! I’ve developed an exercise campaign whereby I run up and down the stairwell of The Arcade….I stay on the 7th floor so it feels like I am doing something to balance my eating the ever present French bread. I’d hoped to use the hotel pool but the pump is broken and the “pool technician” has compensated by adding enough chlorine to turn your skin green. Obviously I am getting seriously stir crazy. My “work” everyday is to write the Country reports and updates for the website and to copy music for my IPOD. I’ve read both novels I brought, all the magazines that everyone else brought and now I’m reading “Dark Continent My Black Arse” by Sihle Khumalo which is a personal account of a Black South African who journeyed by public transport from Cape to Cairo. It’s quite humorous so far but I think he hopes to do more than make the reader laugh so I’ll carry on reading. Every night we all go out to dinner and I look forward to the point at which either John or Karl begins telling a joke….they alternate telling jokes one after another and seem to have an endless supply. The other day we got Garth relating some hilarious stories about his early days as a medical doctor in South Africa. I’ve discovered an interesting fact about our group….everyone else has been married for at least 12 years with a total of 126 years of married life between them. They must know something I don’t, so I am going to study them carefully over the next few months. I had Gail cut my hair on top although she stopped before I had the Rod Stewart look I was hoping for. Washing our clothes in the bathtub is part of our daily routine and every day we make a big deal out of a visit to “the shops”. We spent two days checking out supermarkets and today we actually bought stuff. Ho Hum….when can we get on the road? We heard that there are a few festivals going on in the Ring Road area this weekend. It would be great if we could get our vehicles in time to get there. I have a 3kg Christmas fruit cake soaked in brandy in my suitcase. I commissioned Shireen Oake from Maun, Botswana to make it for me as she is quite famous for her cakes. Hopefully we won’t be sitting at our hotel in Douala on Christmas Day eating this cake. New Year’s Eve is the traditional time to reflect on life and this journey has given me plenty of time as I am traveling solo. Setting off from Douala was just pure pleasure to finally be in motion. 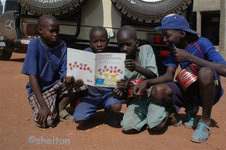 Since then, we have spent 8 long days of driving some of the most difficult roads in Africa. Hours of grinding up and down steep mountains, around narrow hairpin curves, negotiating a constant flow of potholes large enough to swallow a careless vehicle and all the time throwing up clouds of red powdery dust. Every so often we were teased by sight of 100 meters of smooth tar inexplicable set between long lengths of red dirt road. Who would build a road in short sections? One theory is that the tar bits are mountain tops that would wash away during the rains so they require tar…. We will never know. As we weaved our way around the potholes we were also needing to avoid the oncoming traffic mainly consisting of small taxi motorbikes carrying huge loads (as many as 4 people, goats, mattresses, huge sacks) which carried names like “In God’s Hands” or “God is with me” prominently displayed on their sides. The driver would be blinded by our dust as they whizzed past us and I often felt they must have some divine intervention as we never saw one knocked down. The public mini busses were always packed solid with passengers and carried heavy loads on their roof, often a few men or goats tethered there as well. One nice thing about bad roads is that it forces one to drive very very slowly, thus you actually see more because you are not rushing past. We had time to wave to people and shout “Bonjour”. We had time to notice their traditional costume and homes which depict a lifestyle that hasn’t changed in the past few hundred years. 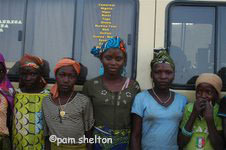 Northern Cameroonians we met were slim, attractive people (we never saw an overweight person! ), predominantly Muslim and extremely friendly and helpful. Not one grimace or look of arrogance at my fractured French and often we were given more directions and advice than we needed. I was happy to see their dogs treated so well, mostly fat golden retriever types, as this is often an indicator of a compassionate society. When we camped at night, the local villagers would come to peek (we must have seemed like the circus coming to town) and after greeting us, chat quietly among themselves. We never once had anyone acting aggressively or demanding anything from us. 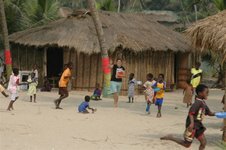 One night we camped on a village’s football pitch and when area teams came to play, they good naturedly played around us. Remember that Cameroun is extremely poor and lacking in proper heath care and educational opportunities. Politeness just seems to be part of their culture. We had an interesting Christmas Eve dinner as we camped on the Bamenda Church Centre lawn. A French couple who were traveling alone joined our dinner party and we exchanged stories. It seems the chap was a member of the French rugby team until he suffered an accident which resulted in paralysis of his legs. His message to us was “Life is fragile. Enjoy every day you have.” He is quite an inspiration as he drives their modified 4 x 4 and has just driven from France on their way to South Africa. So, I am busy experiencing joy every day. I am working at putting 2007 in my history book. 2008, here I come! 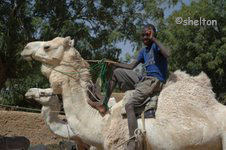 We arrived in Niamey, Niger, yesterday and checked in to the Sahel Hotel. It’s a 2 star North African hotel which means it’s clean but overpriced with peeling walls and lacking items like toilet seats. Even so, having a private flush toilet is a luxury after weeks of Muslim squat toilets with their buckets of water for flushing. We will stay here 3 nights as we wait for Dave and Matt to arrive from Johannesburg. We have checked our vehicles in for 5,000 km service, sent out our laundry, and found an internet café. Last night we had a lovely meal of beef brochettes (a specialty of Niger) on the hotel terrace which overlooks the Niger River. We are savoring the fact that we have made it into Niger. 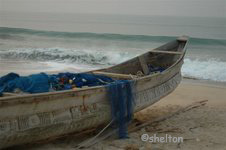 When I last wrote, 2 weeks ago, we were heading north in Cameroun. We stopped to tour the Wasa National Park which was reputed to have a wide variety of game to view. We collected the requisite guide, paid the steep entry fee and began to drive on roads that had been destroyed by elephant footprints during the rainy season. After a bone jarring few hours, half of our group returned in disgust to wait at the Park entrance. 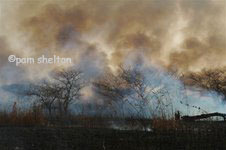 The park had 7 different bush fires burning and several times we had to drive over middle manike grass in flames. We saw only a few giraffe and a Tessabe antelope and a wide variety of birdlife. Our guide assured us he knew a waterhole where we would see over 100 elephant. We were distressed to find only a baby elephant less than 6 months old hiding in the grass there. We waited over an hour to see if the herd was nearby but no luck. We hope that poachers have not been setting the fires and distressing the elephants as it is very unusual for a herd to leave a young baby on its own. We informed the Park Service as we left but I have the feeling the baby is finished. Actually, I see little hope of a future for any of the wildlife in this park. 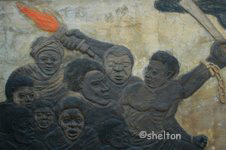 We camped near the Park entrance where there were large kopes (hills) and women and children were busy making gravel out of larger rocks, breaking them one by one with mallets. Simple survival is a day by day struggle for them and we present a sharp contrast with our luxury vehicles well equipped with every convenience. I am still not comfortable with this situation but it’s a reality we can’t ignore but can do little to change. We crossed the border to Nigeria with no real delay but were forced to camp in the parking lot of a hotel named Ali Charman in Maiduguri because we didn’t want to drive after dark. The hotel’s name is a joke as it is especially uncharming accommodation. Slowy and Leony rented a room (as they sleep on cots in the open) and used their own cots rather than the saggy bed provided. It was a sleepless night between the call to prayer on the loudspeaker at the next door mosque, the rooster crowing beginning at 4:00AM, motorbikes moving in and out of the parking lot all night and late night guests chatting loudly. 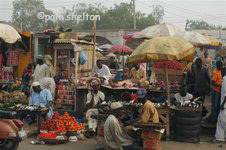 It was a relief to head off for Kano in the morning. Nigeria is a true test case for the experiments on overcrowding. When you put too many mice in a box, they need to compete for resources and manic personality disorders set in. I think this may be the case in Nigeria where the population is a whooping 140 million. The traffic moves without any care and vehicles overtake into the face of oncoming traffic at tremendous speeds. We witnessed an overloaded taxi accident whereby over 20 people were injured or killed, mostly women and children. Too terrible. We reached Kano in one piece and set up at Kano Tourist Camp, basically a gravel parking lot and home to millions of mosquitoes. We immediately entertained a steady stream of “salesmen” and money changers. We bought 2 huge drums of black market diesel which was siphoned into our vehicles. It seems that over 75% of the Nigerian service stations are closed and the few that are open have long queues stretching down the road. Black market fuel is sold along side the road in containers from Coke bottles to drums. 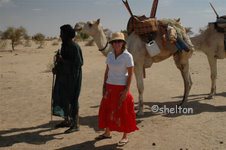 The CAMEL needed a new battery which was hand delivered to our camp by an enterprising electrician. The Diers have nicknamed me “The Chipmunk” because I have so much tucked away in The CAMEL. When Garth needed a tiny screwdriver to fix his radio, I had one. Need a certain size cable tie? I have them. When Garth cut his foot and needed a certain bandage, my first aid box was the source. Too many years of Girl Scouts, I guess. 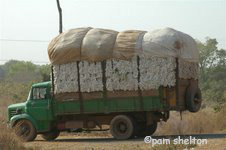 Indigo dye pits.............. and fabric................................ traffic! We took an organized tour of Kano to see the famous indigo dye pits and the old crumbling walled city. The indigo fabric patterns had names like “Zebra Stripes” and “Stars and Moon” and most of our group helped the business by purchasing tablecloth size fabric. I enjoyed being a passenger during this tour and realized how stressful it had been to drive through Nigerian road traffic. There seems to be a total lack of municipal maintenance in Nigeria. Street lights and robots are not working, rubbish is not collected and the traffic is a free for all. 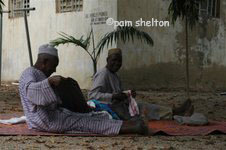 At our camp, we all became fond of the two old laundrymen who used their prayer mats to fold our laundry between prayers. We were laughing until we discovered our one night stay at the camp was to turn into 5 nights as we struggled to get Niger visas. 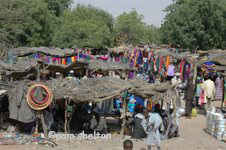 We had left Kano Tourist Camp the first morning for the Niger border thinking we would purchase visas there. No luck. We had to return to Kano to apply to the Niger Consulate. We spent 5 long days sitting in the consulate lounge or napping in our vehicles waiting for visas. Every night when the Consulate closed we headed “home” to Kano Tourist Camp. Our laundrymen always greeted us with huge smiles as did the moneychangers. Tempers were on best behavior during this stressful period although we did have a few flare-ups. 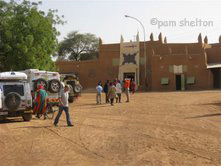 It was a welcome relief when we finally got the visas and headed off for the border to Niger. Visas were given to us only with the agreement that we would change our itinerary so as not to travel to Agadez and the Air Mountains where there is supposedly rebel activity. We arrived in Zinder just at dusk. At the police check stop, we were escorted into town to get “registered”. Long wait there due to the call to prayers. 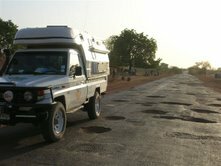 We ended up 5 km out of town at Zinder Tourist Camp, which hasn’t be used much lately due to the slow down on tourism in Niger. The courtyard where we set up, was swept clean and the staff all turned out to greet us. They cleaned a shower and toilet in our honor and 3 “licensed travel guides” made a plan to meet us at 8:00AM to show us the Sultan’s Palace. Our experience so far with West African Palaces has left us a bit cynical….very expensive entry/camera fee to see crumbling walls, dirty courtyards, faded relics and evidence of the guards residing in the rooms. Ever hopeful that this would be different, we were told to bring gifts as we would be meeting the Sultan himself in person. We gathered an assortment of cadeaux (jams, biscuits, cigarettes and books) and began our tour. The Palace Guards insisted on giving the tour which meant our English Speaking 3 Guides just hovered around us while we listened to the French tour translated by Slowy. Several things were interesting, I thought. The gris gris (voodoo) objects hanging in every doorway for protection; the tiny cave-like prison cells hollowed out of the wall where up to 40 prisoners of the past Sultans were held without even room to stand or move; the judgment cell where butter was smeared on the wall to attract scorpions (if the prisoner was bitten, he was guilty of the crime) and the tiny cave rooms allocated to the Sultan’s wives in the past. At the end of our tour we were told the Sultan was busy and we needed to make an appointment if we wanted to see him. We laughed and left. 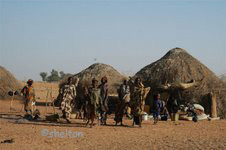 We drove until 5:00PM and then asked permission of a local Hausa chief to camp near his village. Within minutes of our parking our vehicles, the whole village came to watch us set up. They were polite but obviously curious and over 100 pairs of eyes watched our every move. 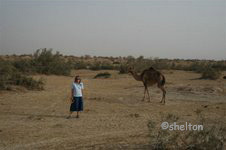 A group of young girls attached themselves to me and stood beside The CAMEL watching my camp set-up. They were learning French in school and were anxious to communicate. I admired their tribal facial scars of which they took obvious pride. One preteen girl had an intricate design carved into her forehead as well as the typical “cats whiskers” cuts. They were decked out with jewelry and colorful dresses and, like girls everywhere, grinned when I told them they were “tres jolie”. 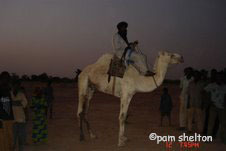 Just at dusk, a lone Tuareg man on his camel rode up and posed for photos. It was a magical moment despite the fact he was quick to make it clear he expected some cash for posing. Then the village children, coached by Erna, sang us a few songs. 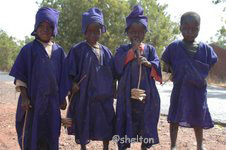 Six village men arrived with a stringed instrument and began to sing in Hausa. Juno, emboldened by whiskeys, got up to dance with them. It was a memorable evening. It was a full day’s drive to Niamey with a few stops for stretching, for lunch and to watch a Niger village wrestling match. These matches are part of the local culture and it was neat that we had a chance to see a few of the young men wrestle. The crowd seemed pleased that we wanted to cheer on their young athletes. The Niger roads are a joy compared to Nigeria. There is much less traffic and the drivers more courteous. The government is in the middle of building a new highway from Zinder to Niamey and we were able to drive on bits of it. Mostly we drove on the dirt side road but we still made good time. We bush camped off the road and except for a passing herd of cattle and two herd boys, we had a quiet evening. We all toasted Moon, Leony and Slowy as this was their last night of camping. Now we are at the Sahel Hotel living like Sultans for a few days…. The past few weeks have been a bit of a blur to me as we traversed 4 countries in 12 days! We crossed the border from Niger to Benin on 18 January, entered Togo 6 days later and found ourselves in Ghana on the next day and then 5 days later we were in Burkina Faso. We managed to zip in and see quite a few of the highlights of each country but I’m still trying to sort them out in my mind….meanwhile we are about to exit Mali and head to Senegal. The feeling that voodoo was all around me (I’d read Stuart Butler’s account in his guide to Benin) but I just couldn’t see it. And then we were in Togo which you can drive across in a few hours but we were delayed overnight by our Ghana visa problems and still I never got a feeling for the place. I remember white sandy beach, palm trees and Chevron Oil Refineries…Sorry, Togo. Maybe another time! Vivid memory at the border of trying to guess how many kilometers of brilliant African cloth walked past me every hour…. Emptying my gift school supplies, books and a plastic blow up globe into the arms of two University of California students who were attempting to set up a school program for the children of Ada. Go girls! 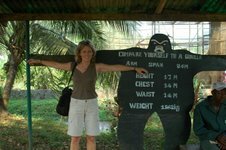 Letting go of my hope to see Cape Coast and Kakum National Park but holding tight to the idea we should stop at the Baobeng-Fiema Monkey Sanctuary. Dave and I had a magic moment when we lingered behind the others and I started to call to a large Black and White Colobus monkey in a tree “Here boy…come here boy…” and suddenly he swung down from the tree and began to make his way toward me through the underbrush…he was probably going to go that way anyway but Dave and I both look big-eyed for a minute as our primate cousin sped past us and was lost in another tree. I remember wishing if only primates were considered taboo to eat in Gabon they would be protected like these monkeys are in Ghana. Ghana had World Cup fever while we were there and their national spirit was fun to watch. Every car we passed was draped with flags, people with hats or shirts sporting the Ghanaian colors, buildings draped with flags. 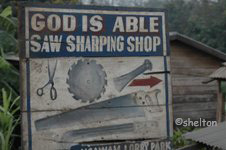 I almost drove off the road a few times trying to take a photo of the signs advertizing businesses…they all seem to have a religious tone “God’s Axe Sharpening Business” or “Lord’s Rest Coffee Shop”…each one seemed better than the last. Saturday is funeral Day in Ghana and those attending dress in traditional Ashanti clothing…a black or red toga style cloth, mostly. We drove past many funeral processions as they marched down the streets. 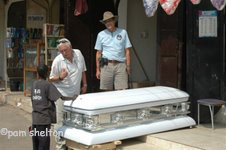 I had hoped to visit the famous coffin shop on the Tema Road in Accra where customized coffins are created reflecting the owner’s life style or hobbies….in the shape of a banana if he was a farmer, for example. 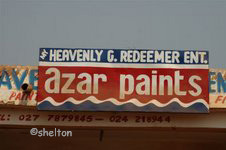 We did manage to see a few interesting examples of custom work in Tamale just before we headed to the border. And then we were in Burkina Faso which has shockingly poor people but the most 21st century "star wars" style buildings in the capital, Ouagadougou. After kms of poor mud huts you drive into a city with four modern buildings that stand out like torches. Interesting. No one could explain who paid for them and we were not around long enough for me to act the sleuth. 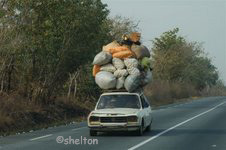 As we left Burkina Faso we were back to overloaded trucks and we saw something new…fully grown cows strapped to the loads ON TOP OF THE ROOF of the combis…how on earth did they ever get them up there….wish I had been there to see. 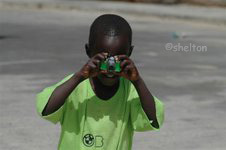 Off to Mali….I will have to write about Mali from Dakar. I’ve run out of time and its 2:15 AM and time to grab a nap before we hit the road tomorrow! 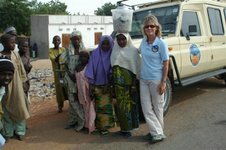 It wasn’t until Bamako, Mali that I finally discovered why I had been feeling like I was drugged with a depressant….through a silly mistake, I had been taking 9 weeks of LARIAM, (Mefloquine) the dreaded malaria prophylactic, instead of Malarone which doesn’t have the horrible side effects of LARIAM. Now, 2 weeks without a dose of LARIAM, and I feel like myself again….after a few days of not speaking but 20 words all day, I am running at my usual high energy. I will try to be objective about Mali but it is seriously coloured by LARIAM dreams. 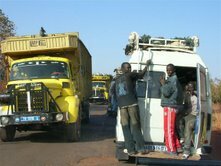 Leaving Burkina Faso and entering Mali was a breeze (literally, as the Harmattan winds were at our backs). Roadside scenes changed as we passed green fields filled with mango tress, ladies with lips tattooed dark blue selling fruit, vehicles loaded twice their height with rooftop bundles often with passengers or livestock tied on the tip top. 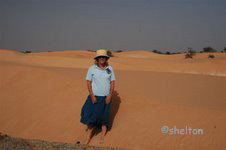 Gradually the landscape became flat with rolling sand dunes….the SAHEL! 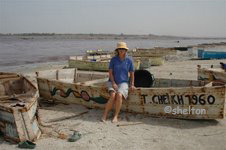 We crossed the Niger River on a ferry to reach the ancient town of Djenne. The town is dominated by the Grand Mosque (dated 1905) which is in the centre of a maze of narrow twisting sandy streets full of activity at every hour of the day. The town’s children all know the words Cadeau (gift) and bonbon (sweetie) and they chant this at every European until one no longer even hears them. There are European tourists everywhere and we all make a show of not seeing each other. The Mosque, similar to all mosques made of mud, is covered with wooden poles projecting from the sides like a porcupine’s quills. This is creative scaffolding used annually by the local people to “remud” the walls after the summer rains are over. We photograph the Mosque from every angle before the crowds of Cadeau kids, Faux tour guides and persistent peddlers drive us out of town. We negotiate a deal with the Swedish lady who owns the newly built Dejenne Dijano Hotel and we rent one room for the shower and toilet and then set up our “Mobile Homes” outside the hotel gates. The hotel is built the traditional way with cool walls of mud built in the graceful Sudanese style, yet maintaining modern plumbing and immaculate furnishings. Lovely ambiance with candlelit dinner served in the open courtyard. Another magical evening marred only by the Stallion’s car alarm going off suddenly at 2:00AM. I began joining Dave, Garth and Matt to take photos when the light is best (early and late in the day) and we walked the back streets of Djenne. I found the famous “mud cloth” shop named Pama Sitola and bought a lovely cloth of the traditional tan/brown and black colours. I was sad not to have been able to stay in the shop for the traditional “3 cups of tea” but the group was raring to go and were already driving back to the ferry so I raced after them. 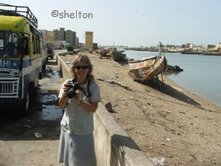 We took the ferry back to the main road and head toward Mopti. Dave, Matt and I stopped for a brief adventure in exploring Mopti waterfront while the rest of our group move on toward Bandiagara. It was a depressing place as many lepers and cripples haunt the area, along with Muslim schoolboys wearing rags and with a tin can on a string around their necks to collect their dinner by begging. I was a supreme target and after I emptied all my hotel soaps, a box of biscuits, sweets and coins into begging hands or stumps, I felt flattened by it all and retreated to sweat in THE CAMEL until Matt and Dave were ready to go. The only other place I have seen lepers is Niger and Ethiopia but Dave assures me that all over South Africa there are leper colonies. Of all diseases, leprosy seems the most terrible and truly robs a person of everything, even their dignity. We joined the gang at a campground called Togina just outside of Bandiagara. There was time to wash a few loads of clothes, download photos and for Garth to get our guide hired for the trip to Dogon Country. Our Dogon guide, Osman, was a real gem. He spoke English clearly and explained the history and customs of his tribe. 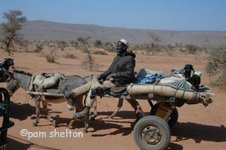 We set off in the morning, Osman riding with Garth, Gail with me, on our 3 day, 2 night trip to see the Dogon villages set along the Bandiagara Escarpment. 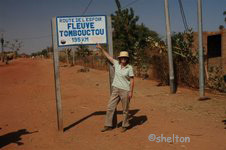 We stopped at the villages of Douton, Nambon, Yawa, Ledyina, Komokani, Tireli and Yendum. 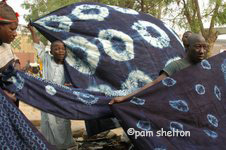 The first village, Douton, we were besieged by the cloth sellers who swirled their indigo cloths in our faces until we felt dizzy. 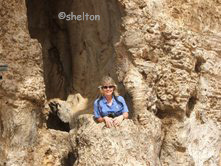 As we hiked up the narrow paths, the ladies kept pace and it was often difficult to see where we were going. Eventually, politeness gave way to frustration as each of us made it clear to the salesladies that we would not buy cloth on the paths…they retreated to wait by our vehicles where most of us succumbed to the pressure and bought a cloth. I have to be careful as THE CAMEL is beginning to look like a shop now and getting a bit crowded. 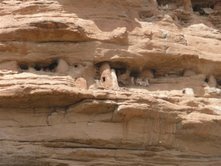 The villages were interesting and the Tellum, ancient pygmy cliff dwellers, left homes that remind me of the Pueblo Indian cliff dwellings in the American Southwest. 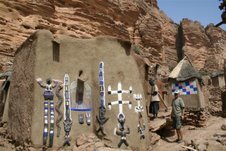 I’ve recently read several articles relating the negative effects of tourism on Dogon villages and I have to agree. With so many tourists tromping through, very little seems sacred or traditional anymore. The emphasis is definitely on commercialism…sell everything including old masks, weavings, doors, keylocks and anything else a tourist is willing to pay for. The children follow us chanting the “gimme a cadeau/bonbon/stylo/bic song”. It is like the incessant buzzing of mosquitoes and is relentless until we all lose our equilibrium, forget we love children and snap at them. 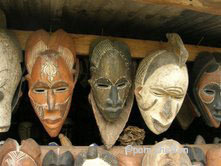 The village poverty, lack of viable opportunities and degradation of Dogon culture is depressing. 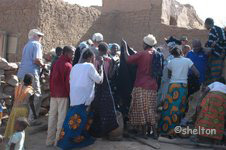 We encountered a continuous stream of hiking tourists who were camping in each village with a Dogon guide. As the baking dry heat shimmered off the sand and rocks and reflected up to hit you in the face, we were glad to return to our air con vehicles for the short drive between villages. We are all past the age where you suffer needlessly…heh heh. The Dogon women dress in a riot of colourful fabric and shining jewelry but usually refuse to be photographed. Following Osman’s advice, we bought a large sack of expensive ($25.00 per Kg) Kola nuts as gifts for the chief and important elders in each village. The red shelled nut is a stimulant and appetite suppressant when chewed and the essence of the nut is the base for making Coke Cola. We handed them out freely and it seemed they were so expected they didn’t require acknowledgement. The Harmattan wind blows dry and dusty and our eyes are constantly irritated. 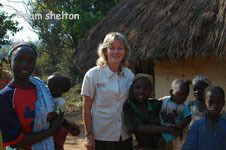 Many children have conjunctivitis eye infections and I had extra eye drops which I left to treat kids in one village. By the end of our first day, the constant harassment from the “gimme a cadeau” children had worn us all down. 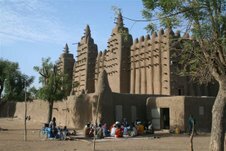 We decided it was almost as tough as being attacked by a swarm of bees and there was some talk about pushing through our Dogon visit early. Fortunately, by day two we toughened up and learned not to react to the children or answer them and to put our minds on a different plane. IGNORE was the rule of the day…but sad. None of us were comfortable with the situation and it was certainly not our normal manner of interacting with children. 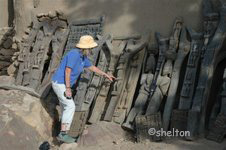 It was with a fair share of relief when we left Dogon Country and headed off toward Timbuktu. We camped beside a millet field about 200km from Timbuktu where we found ourselves alone for the first time in days. I woke up at 4:00AM and took a walk…the silence was profound, like nothing I have ever experienced before. In the Kalahari or the Namib Desert, there are always sounds of insects, animals or trees rustling but in the Sahara there is true silence. And the stars….I’ve never seen so many at once and right to the horizon in every direction you look. Truly magical. A desert beyond all deserts. Our drive to Timbuktu was awesome…the road was constant corrugation but the scenery was incredible. I am a true desert lover so I was in my glory. 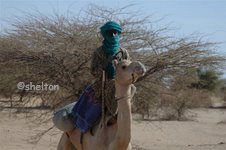 I stopped every time I saw a camel or Tuareg striding along the dunes in his blue dress and Turban and just grinned. Lovely. Timbuktu is just a non descript little Muslim town but its fun to say we had arrived and “been there”. We had a lovely dinner at a small open air café with Malian music playing and lanterns twinkling. We all selected some Tuareg jewelry from the steady stream of vendors in their blue dress and turbans…they told us the story behind each mark on the silver bangles and necklaces such as caravan routes, oases, camel hump, stars in the sky, Tuareg passport to heaven etc…very romantic and we were a sellers dream as we fell right under their spell. We spent a morning touring the manuscript museums that Timbuktu is famous for and then stopped at the road sign to have our vehicles immortalized. As we left Timbuktu, I was feeling a bit flat and that feeling got overpowering over the next few days as we negotiated the ferries through the Niger River delta. 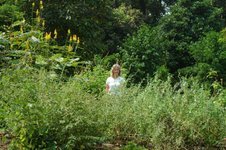 It wasn’t until we arrived in Bamako that I figured out what was wrong…I was suffering the side effects of LARIAM as well as a kidney infection. Thankfully I am back to myself and enjoying life. As we crossed the border from Mali to Senegal we agreed to push ourselves to get to Dakar by Thursday night, bush camping along the way. This would enable us to visit the Embassies on Friday in search of visas. The road started with clean tar but quickly deteriorated to a surface that looked like Swiss cheese. Very tiring for the driver as we “slalom-skied” hour after hour trying to miss the deepest holes AND the huge oncoming trucks which refused to “give way” and would often carry on in the choicest part of the road even if it meant driving down the centre. Hours of playing chicken are not much fun! The Senegalese scenery can be summed in 5 words: Baobabs, Horses, Salt, Grass and Shine. We have Baobabs in Southern Africa; in fact they are my favorite tree as they resemble the trees from the film Wizard of Oz, another of my favorites. We all agreed we had never seen forests of Baobabs like we saw in Northern Senegal…hundreds of trees in forests stretching for kilometres. The soil conditions must be “just right” for these gentle giants and we imagined them lumbering out into the road and addressing us with deep Tolkien voices. Horses, horses everywhere …. 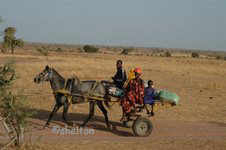 Every 10 seconds I saw a horse …working horses pulling carts loaded with families going to market, horses pulling carts loaded with produce, horse taxi carts...the horses have fine features suggesting Arabian bloodlines and for the most part, they seem well cared for. The first night we bush camped, a group of small boys driving a horse cart on their way to cut firewood, stopped to gawk at us. We gave the boys a few sweets and then I tried feeding their horse some carrots…not interested (probably never seen carrots before) but when I smeared honey on my palm, he was keen. 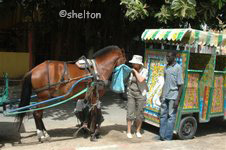 So were the boys who eagerly accepted their share alongside the horse…but not on my palm, heh heh. We all had a good laugh together at the sight of the horse trying to get every last bit of honey off his lips. 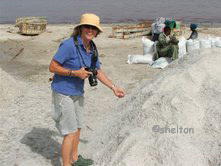 As we approached Kaolack, we noticed huge bags stacked alongside the road and soon we passed enormous salt pans where the local people are busy removing the salt and packaging it for market. It would have been neat to stop and visit the primitive pan operation, but we had a schedule to keep so we raced on. Northern Senegal is all about huge grasslands and local people seem to use grass in every aspect of life…grass houses, grass roofs, grass baskets, grass in bundles as horse fodder, grass woven fences….everywhere you look, grass. Quite a switch from the sands of Mali. Senegalese women love to SHINE. Even in the tiniest and modest village we drove through, many of the women managed to wear at least one piece of shiny fabric….dress, shawl or headdress, it would catch the sun and glitter. The dress here consists of a loose fitting overblouse and a wrap skirt (pagne) of the same fabric and a head cloth (foulade) tied in a bow over the forehead. The women resemble smartly wrapped presents. Older or heavier women might wear a Grand Boubou which is a large loose fitting caftan style dress but they are also often accessorized with shine. 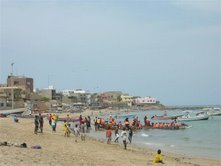 Dakar lives up to its reputation as a city that overwhelms most tourists. 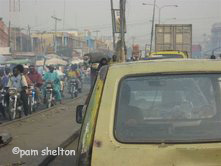 The sheer hustle and bustle is grating after weeks in Mali where things move at a slower pace. Hustlers approach you day and night “My Sister, My Sister” is their chant aimed at every European woman. Everyone has something to sell you, including themselves as tour guides or more….small pup tents are set up at one end of our beach and as we watch, at every hour of the day and night Europeans pay to enter for an “African Encounter” with one of the lovely long legged Senegalese girls (or boys, your choice). Too terrible and sad, I think. We are grateful to have located hotel rooms as there is a huge Islamic Conference beginning in Dakar that will reach full steam in mid-March but already hotels are booked solid. Yesterday, as we were returning from our Embassy trip, we got stopped at a robot where a huge crowd of Muslim fundamentalists carrying placards were noisily crossing the street. The placards were proclamations condemning homosexuality, and as we watched, the crowd suddenly turned around and broke into a full run. We quickly closed our vehicle windows but not before we got a blast of tear gas which police were using to disperse the crowd. I’m glad we are leaving tomorrow as fundamentalists of any sect are scary people. 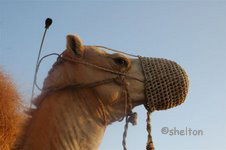 I’m really looking forward to the desert travel ahead….I long to get back into wide open spaces…camel country. 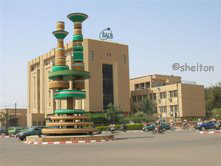 Next entry will be from Nouakchott, Mauritania. Au revoir! Those pesky Moroccan visas for our 3 South Africans are proving to be a delay for the group as we waited in Zebra Bar Campground near St Louis, Senegal for 2 nights waiting to hear if the visas would be granted…now we are squashed in a tiny courtyard of a hotel in Nouakchott, Mauritania waiting to the passports to arrive at DHL. We are making the best of it by keeping busy…actually, I am thrilled to be taking more time in each country but I have the sinking feeling that because most of the group have deadlines for the trip’s end, the days we spend waiting now, will mean speeding through Morocco and perhaps missing some of the great experiences there….if this proves to be the case, hopefully I can make a return visit in the future. Senegal, north of Dakar, is much as I described earlier but substitute Ocean for the grass and baobab forests…there are salt mining operations, working horses and plenty of SHINE to the ladies clothing. Some of us spent the day in St Louis exploring the back streets, shops, fishing operations and a funky museum. The trip from St Louis to Nouakchott was a full day of driving with a fairly sane border stop on the way. Once we reached Mauritania the landscape changed dramatically and our radio buzzed with comments like “Are we on the moon?” and “Look at all the national flowers!” (Referring to the plastic bags attached to every thorn bush”). We wanted to reach Nouakchott before dark as this is the area where the French tourists were killed last month so we didn’t make as many photo stops as we usually did…only for camels (always!) and a few stops for the dunes and the huge gleaming white nomad tents with open sides to let the breezes in…we would stop, jump from the vehicle and “snap snap” and leap back into the vehicle and be off again hoping that in our haste we had remembered to turn the camera on. We heard Nouakchott was a slum and we found this to be true….the farther north we travel, the greater the rubbish disposal problem seems to be. Huge fields of litter on the outskirts of the city and heaps piled on the centre medium on every street. The people drive cars without a care so I went into my New York taxi driver mode…one hand on the hooter (horn) and pushing with the best of them. Fun actually, once you get into the swing of it. It helps to have the biggest vehicle on the street! Our campground turned out to be a teeny hotel parking area where we wedged our vehicles with room just enough to open our doors….after one restless night, the group decided to move to the beach campground and we raced off there to check in….we realized in a half a second that there was no shade whatsoever, no windbreak (the desert wind is searing hot and full of fine sand) and that we were much better off in our tiny courtyard where we had a hotel lobby (cool area) to chill in, and a wall surrounding us to cut the wind. Thankfully our space there was still free and we set up again as Friday was a Muslim holiday and DHL was closed. 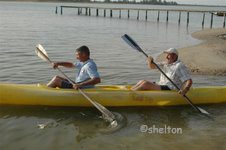 I spent the day writing the Adventure Update (with Gail), sending emails, and sorting photographs. Some of us ate a lovely traditional Mauritanian dish for dinner prepared by the hotel staff. Tegine is a stew flavored with subtle spices and lemon slices, baked in an earthenware casserole and served with bread and rice. Absolutely delicious! Some of the group are mourning the lack of alcohol in shops here, but I hid some Vodka in a water bottle and enjoyed a cold vodka tonic before dinner….unfortunately, I thought it was water earlier in the day and took a few huge gulps before I realized what I was drinking…now I need to ration my supply until we reach Morocco. Gail has gin hidden in her sock and we laugh every time she uncovers the bottle! A delegation went to DHL this morning and was able to establish that the passports have made it to Dakar, Senegal and should be in Nouakchott tomorrow. We have our fingers crossed that we can collect them in the morning and head off to the desert oasis of Atar. Meanwhile, we will explore the markets of Nouakchott this afternoon and then watch the fishing boats arrive with their catches tonight. Life is what you make of it…reach for experiences every day! Once we leave Nouakchott, we may not have an internet connection again until Morocco….until then, au revoir!